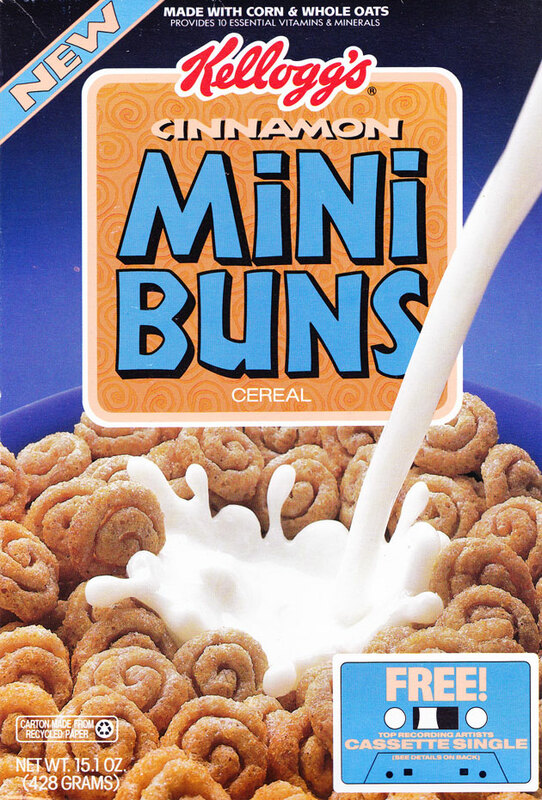 According to a 1991 magazine ad for this cereal, "Your kids can enjoy the taste of cinnamon buns for breakfast with no added fat or artificial flavors. Just corn and whole grain oats and plenty of the cinnamon crunchy taste they love. New Kellogg's Cinnamon Mini Buns. Little buns that are big on nutrition." 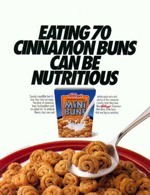 The ad was titled, "Eating 70 Cinnamon Buns Can Be Nutritious". Television ads in 1992 described the cereal this way: "They're like cinnamon buns... the size of cereal. Everyone's crazy about Cinnamon Mini Buns... made with corn, whole grain oats and a sprinkle of cinnamon. The big taste of cinnamon buns... the fun size of cereal." "As a Mom you've probably heard a lot about nutrition and how important it is for your kids to have a well-balanced diet. Unfortunately, some foods that are nutritious just aren't very appetizing to them. 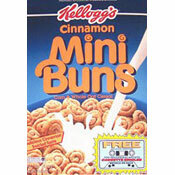 So here's some good news for you: New Kellogg's Cinnamon Mini Buns cereal. Made with wholesome corn and oats, and there's no added fat or artificial flavors. Not to mention a delicious cinnamon-swirled taste your kids will love. So if you'd like to get more nutrition into your kids' diet, remember that it doesn't have to be the kind that's tough to swallow." The ingredient list - when the cereal first came out - consisted of corn and whole oat flour, sugar, corn syrup, salt, caramel color, cinnamon and a smattering of vitamins and minerals. 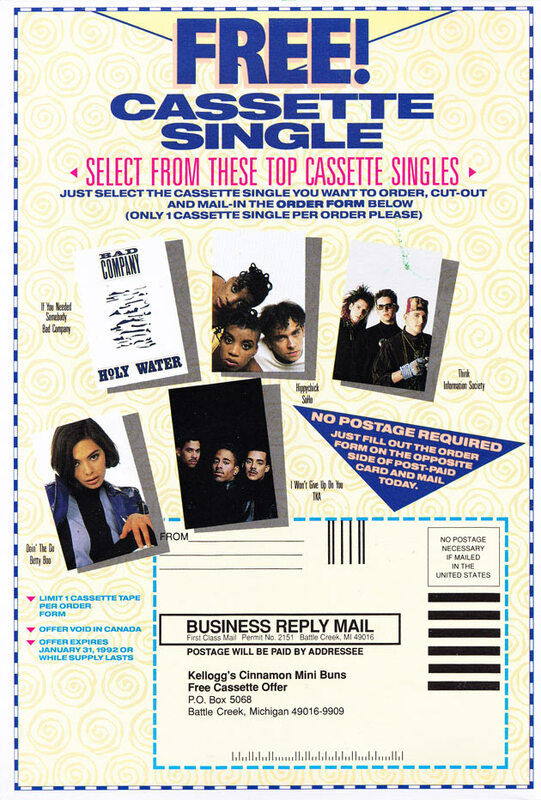 The box that we were lucky enough to get had a send-away offer for a free cassette single. You could choose from the following artists: Bad Company, SoHo, Information Society, Betty Boo and TKA. What do you think of Cinnamon Mini Buns? View all 21 comments for this cereal. I haven't thought about this cereal in years. It was so good! Florida... early nineties... holidays... family time... sitting at the pool in the sun in the morning slurping my Mini Buns while dreaming of the Wilson baseball glove and bat that you could win in the Kellogg's competition... childhood memory at its best. 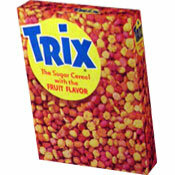 This cereal was so awesome. 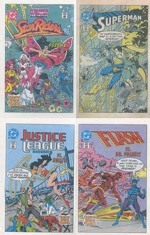 I miss this one like most others from the early 90's. If only I had a time machine. I want my Cinnamon Mini Buns! Darn you Kellogg's! Fond memories of this cereal. Saturday morning cartoons and delicious Cinnamon Swirls. Why oh why do they no longer exist? Seriously. Frickin' A. Loved this cereal. The Cinnabon cereal from a couple years ago was good, but this one was better. Bring it back!!!! I so wish I could have a bowl right now! Best cereal I ever had in my whole life. Wish I could get them still! I loved the Mini Cinnamon Buns. I want them back. This cereal would leave a filmy coating inside your mouth. This is the only cereal I can remember having. Simply the best.